The great pleasure of my pilgrimage to the manor houses was not only to look around the architectural features and old furniture but to encounter the stories of ghosts or mysteries associated with the houses. 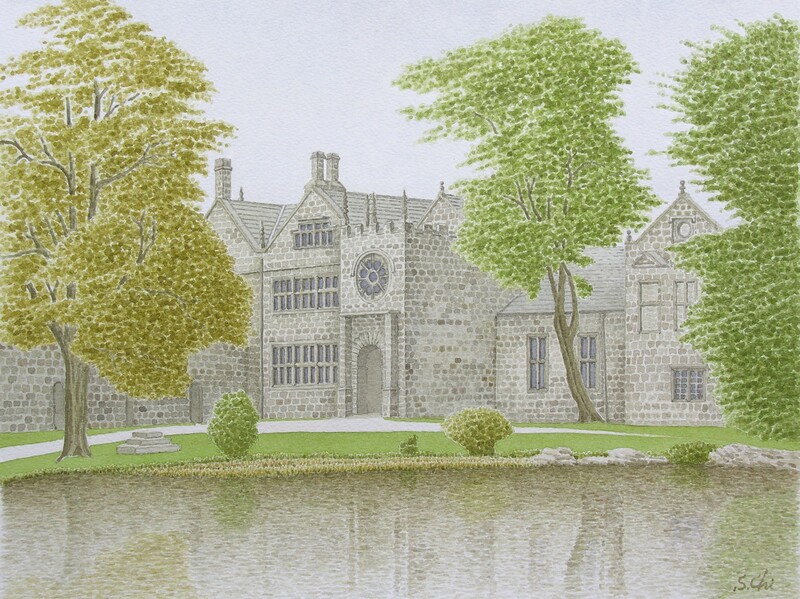 East Riddlesden Hall, standing on the River Aire in Keighley, about 19 miles to the northwest of Leeds, is a manor house rebuilt in 1642, having its origin in the Saxons Ages before the 10th century. I like this manor house because of its appearance; firm and study rather rough or unrefined. It expresses one of the characteristics of very simple and sturdy English architecture. Some of the most distinguished features of this manor hopuse are the entrance porches projecting at both ends of east and west. They have rose windows above the doorway and battlements with pinnacles on the top of them. The shapes of them reminded me of medieval castles. This manor house has handed down many ghost stories. One of them is the story of "the Grey Lady" and her walled up lover. The leaflet says that she was starved to death in her room because of the "flagrante delicto" case. And her lover was walled up by the lord, who was a man of sadistic nature. Soon after the affair, her footsteps walking on the stairs and the landing were often heard. Furthermore, the face of her walled-up lover emerged sometimes in one of the windows of the house. But this story was in the 15th or 16th century before this manor house was rebuilt. It sounds a little strange for me that the ghosts removed into the new house. Another ghost story is about "the White Lady" dressed in white. When the lady returned from hunting, she was thrown off her horse into a pond in the front of the house and drowned. Her ghost has been seen walking around the pond. The story of "the Scottish Merchant's Ghost" is said to be based on the factual case of murder happend in the 18th century. The merchant, taking shelter at the hall from a blizzard, was killed and the money he had was taken by the Steward when his master and the family were away from the house. I do not know the development of the case afterwards. But, it is said the Steward was hanged for the crime he had done at York Castle in 1790. The ghost of the Scottish merchant might uncover the crime, I suppose. This manor house also has a hiding place called "the Secret Room", it is behind a small room above the entrance porch. James Murgatroyd, the owner of the house in the 17th century and a Royalist, is said to have made the room, preparing for raids from the Parliamentarians, when he rebuilt this manor house in 1642 during the Civil War. East Riddlesden Hall was ruined in the early 19th century. Further it was offered for sale at the beginning of the 20th century. The men who saved this crisis were William A. Brigg, the then Mayor of Keighley, and his twin brother Jhon J. Brigg. They bought the house and repaired it by their own expense, and then they transferred it to the National Trust. As a result of this action, thanks to the Brigg brothers, the ghosts have not lost their home.